Mild traumatic brain injury (MTBI) is a significant public health problem representing 75% of traumatic brain injury (TBI) cases. There are several advanced techniques available for the investigation of changes in thalamic functions and structures, including a functional MRI using a blood oxygen level-dependent (BOLD) technique as well as diffusion tensor imaging (DTI), including higher-order diffusion kurtosis imaging (DKI) to characterize non-Gaussian water molecular movement with better sensitivity in gray matter, morphological shape, thickness and volumetry as well as a micro-structural level magnetic field correlation (MFC) technique to quantify iron deposition in the brain. Each of these techniques provides important insights into the pathophysiology due to head injury that may not be available in a conventional MRI. For instance, we had used a resting-state (RS) functional connectivity MRI (fcMRI) to investigate the integrity of a default mode network (DMN) with several novel methods, including independent component analysis (ICA) methods in MTBI patients and correlated DMN connectivity changes with neurocognitive tests and clinical symptoms. The authors had further examined thalamic and cortical injuries using a fractional amplitude of low-frequency fluctuations (fALFF) and (fcMRI) based on the resting state (RS) and task-related fMRI in patients. There is an increasing body of literature which suggests that damage to the hypothalamic-hypophysical axis has been under-diagnosed and may account for some of the sequelae following MTBI, but with limited supported imaging finding. The authors had then identified both thalamic and hypothalamic morphology, structure, function and pathway injury using advanced quantitative MRI techniques, including DKI and RS-fMRI to reflect both microstructural and functional connectivity and activity abnormalities in patients. Recent work has also demonstrated significant functional small-world property changes in patients, and suggested decreased global efficiency, possibly due to diffused axonal injury and local network upregulation, including increased thalamo-cortical connectivity. About 20% of patients have persistent post-concussive syndrome (PCS) within 6 months to 1 year after MTBI. The authors find an association between longitudinally regional volume loss in the anterior and isthmus of the cingulum and precuneal regions as well as neurocognitive performance/clinical symptom scores. The brain iron is a promising early imaging biomarker of disease in MTBI, and an MRI is an ideal technique to identify tissue iron in vivo. The quantitative microscopic and macroscopic MFC results demonstrate highly significant differences between patients and controls in both the total and microscopic MFC in the thalamus and significant correlations with an R2* constant, suggesting that the component analysis of MFC is a useful method to study in vivo brain iron after MTBI. And finally, the authors had developed and cross-validated the accuracy of multi-feature algorithms incorporating clinical and imaging metrics to objectively classify patients with MTBI compared to controls. This book will introduce the readers with some perspectives using multi-modality imaging for MTBI disease detection and diagnosis, including several imaging hallmarks: functional, morphological, and microstructural metrics. Various advanced technical developments and the longitudinal monitoring of multi-parametric MRI data will be presented together with some forefront, up-to-date and interesting examples in the MTBI research field. 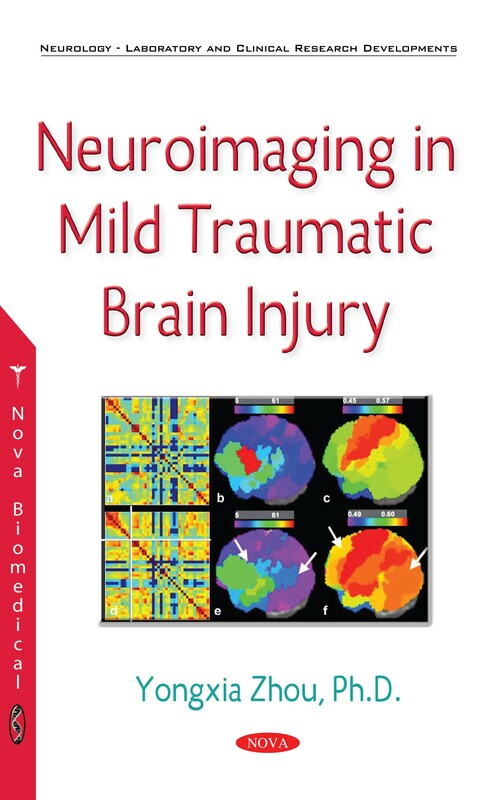 This book will hopefully capture the interests of colleagues in this challenging field and could help convey the technical and developmental information of neuroimaging applications in MTBI. Aron, A. R., Schlaghecken, F., Fletcher, P. C., Bullmore, E. T., Eimer, M., Barker, R., Sahakian, B. J. & Robbins, T. W. (2003). Inhibition of subliminally primed responses is mediated by the caudate and thalamus: evidence from functional MRI and Huntington’s disease. Brain, 126, 713-723. Bajo, R., Maestu, F., Nevado, A., Sancho, M., Gutierrez, R., Campo, P., Castellanos, N. P., Gil, P., Moratti, S., Pereda, E. & Del-Pozo, F. (2010). Functional connectivity in mild cognitive impairment during a memory task: implications for the disconnection hypothesis. J Alzheimers Dis, 22, 183-193. Ben-Simon, E., Podlipsky, I., Arieli, A., Zhdanov, A. & Hendler, T. (2008). Never resting brain: simultaneous representation of two alpha related processes in humans. PLoS One, 3, e3984. Bennett, C. M., Wolford, G. L. & Miller, M. B. (2009). The principled control of false positives in neuroimaging. Soc Cogn Affect Neurosci, 4, 417-422. Biswal, B. B. (2012). Resting state fMRI: A personal history. Neuroimage, 62, 938-944. Buzsaki, G. & Wang, X. J. (2012). Mechanisms of gamma oscillations. Annu Rev Neurosci, 35, 203-225. Carroll, L. J., Cassidy, J. D., Peloso, P. M., Borg, J., von Holst, H., Holm, L., Paniak, C. & Pepin, M. (2004). Prognosis for mild traumatic brain injury: results of the WHO Collaborating Centre Task Force on Mild Traumatic Brain Injury. J Rehabil Med, 84-105. Chatila M., Milleret, C., Rougeul, A. & Buser, P. (1993). Alpha rhythm in the cat thalamus. C R Acad Sci III, 316, 51-58. Duff, E. P., Johnston, L. A., Xiong, J., Fox, P. T., Mareels, I. & Egan, G. F. (2008). The power of spectral density analysis for mapping endogenous BOLD signal fluctuations. Hum Brain Mapp, 29, 778-790. Engel, A. K., Fries, P., Konig, P., Brecht, M. & Singer, W. (1999). Temporal binding, binocular rivalry, and consciousness. Conscious Cogn, 8, 128-151. Garcia-Panach, J., Lull, N., Lull, J. J., Ferri, J., Martinez, C., Sopena, P., Robles, M., Chirivella, J. & Noe, N. (2011). A voxe-based analysis of FDG-PET in traumatic brain injury: regional metabolism and relationship between the thalamus and cortical areas. Journal of Neurotrauma, 28, 1707-1717. Ge, Y., Patel, M. B., Chen, Q., Grossman, E. J., Zhang, K., Miles, L., Babb, J. S., Reaume, J. & Grossman, R. I. (2009). Assessment of thalamic perfusion in patients with mild traumatic brain injury by true FISP arterial spin labelling MR imaging at 3T. Brain Inj, 23, 666-674. Haacke, E. M., Duhaime, A. C., Gean, A. D., Riedy, G., Wintermark, M., Mukherjee, P., Brody, D. L., DeGraba, T., Duncan, T. D., Elovic, E., Hurley, R., Latour, L., Smirniotopoulos, J. G. & Smith, D. H. (2010). Common data elements in radiologic imaging of traumatic brain injury. J Magn Reson Imaging, 32, 516-543. Hoptman, M. J., Zuo, X. N., Butler, P. D., Javitt, D. C., D’Angelo, D., Mauro, C. J. & Milham, M. P. (2010). Amplitude of low-frequency oscillations in schizophrenia: a resting state fMRI study. Schizophr Res, 117, 13-20. Jones, E. J. (2007). The Thalamus. Cambridge University Press, 2 edition 2. Kalcher, K., Boubela, R. N., Huf, W., Biswal, B. B., Baldinger, P., Sailer, U., Filzmoser, P., Kasper, S., Lamm, C., Lanzenberger, R., Moser, E. & Windischberger, C. (2012). RESCALE: Voxel-specific task-fMRI scaling using resting state fluctuation amplitude. Neuroimage, 70C, 80-88. Kempf, F., Brucke, C., Salih, F., Trottenberg, T., Kupsch, A., Schneider, G. H., Doyle Gaynor, L. M., Hoffmann, K. T., Vesper, J., Wohrle, J., Altenmuller, D. M., Krauss, J. K., Mazzone, P., Di Lazzaro, V., Yelnik, J., Kuhn, A. A. & Brown, P. (2009). Gamma activity and reactivity in human thalamic local field potentials. Eur J Neurosci, 29, 943-953. Kirov, I., Fleysher, L., Babb, J. S., Silver, J. M., Grossman, R. I. & Gonen, O. (2007). Characterizing ‘mild’ in traumatic brain injury with proton MR spectroscopy in the thalamus: Initial findings. Brain Inj, 21, 1147-1154. Lopes da Silva, F. H., Hoeks, A., Smits, H. & Zetterberg, L. H. (1974). Model of brain rhythmic activity. The alpha-rhythm of the thalamus. Kybernetik, 15, 27-37. Maxwell, W. L., Pennington, K., MacKinnon, M. A., Smith, D. H., McIntosh, T. K., Wilson, J. T. & Graham, D. I. (2004). Differential responses in three thalamic nuclei in moderately disabled, severely disabled and vegetative patients after blunt head injury. Brain, 127, 2470-2478. Muller, K., Lohmann, G., Neumann, J., Grigutsch, M., Mildner, T. & von Cramon, D. Y. (2004). Investigating the wavelet coherence phase of the BOLD signal. J Magn Reson Imaging, 20, 145-152. Muthukumaraswamy, S. D., Edden, R. A., Jones, D. K., Swettenham, J. B. & Singh, K. D. (2009). Resting GABA concentration predicts peak gamma frequency and fMRI amplitude in response to visual stimulation in humans. Proc Natl Acad Sci U S A, 106, 8356-8361. Pollack, R. (1999). The Missing Moment: How the Unconscious Shapes Modern Science. Houghton Mifflin. Power, J. D., Barnes, K. A., Snyder, A. Z., Schlaggar, B. L. & Petersen, S. E. (2012). Spurious but systematic correlations in functional connectivity MRI networks arise from subject motion. Neuroimage, 59, 2142-2154. Saad, Z. S., Ropella, K. M., Cox, R. W. & DeYoe, E. A. (2001). Analysis and use of FMRI response delays. Hum Brain Mapp, 13, 74-93. Salomon, R. M., Karageorgiou, J., Dietrich, M. S., McLellan, J. Y., Charboneau, E. J., Blackford, J. U. & Cowan, R. L. (2012). MDMA (Ecstasy) association with impaired fMRI BOLD thalamic coherence and functional connectivity. Drug Alcohol Depend, 120, 41-47. Schiff, N. D., Giacino, J. T., Kalmar, K., Victor, J. D., Baker, K., Gerber, M., Fritz, B., Eisenberg, B., Biondi, T., O’Connor, J., Kobylarz, E. J., Farris, S., Machado, A., McCagg, C., Plum, F., Fins, J. J. & Rezai, A. R. (2007). Behavioural improvements with thalamic stimulation after severe traumatic brain injury. Nature, 448, 600-603. Schreckenberger, M., Lange-Asschenfeldt, C., Lochmann, M., Mann, K., Siessmeier, T., Buchholz, H. G., Bartenstein, P. & Grunder, G. (2004). The thalamus as the generator and modulator of EEG alpha rhythm: a combined PET/EEG study with lorazepam challenge in humans. Neuroimage, 22, 637-644. Shim, W. H., Baek, K., Kim, J. K., Chae, Y., Suh, J. Y., Rosen, B. R., Jeong, J., Kim, Y. R. (2013). Frequency distribution of causal connectivity in rat sensorimotor network: resting-state fMRI analyses. J Neurophysiol, 109, 238-248. Silver, J. M., McAllister, T. W. & Yudofsky, S. C. (2011). Textbook of Traumatic Brain Injury. American Psychiatric Publishing, Inc 2nd Edition. Slobounov, S. M., Gay, M., Zhang, K., Johnson, B., Pennell, D., Sebastianelli, W., Horovitz, S. & Hallett, M. (2011). Alteration of brain functional network at rest and in response to YMCA physical stress test in concussed athletes: RsFMRI study. Neuroimage, 55, 1716-1727. Sparing, R., Meister, I. G., Wienemann, M., Buelte, D., Staedtgen, M. & Boroojerdi, B. (2007). Task-dependent modulation of functional connectivity between hand motor cortices and neuronal networks underlying language and music: a transcranial magnetic stimulation study in humans. Eur J Neurosci, 25, 319-323. Steriade, M. (2005). Sleep, epilepsy and thalamic reticular inhibitory neurons. Trends Neurosci, 28, 317-324. Sun, F. T., Miller, L. M. & D’Esposito, M. (2004). Measuring interregional functional connectivity using coherence and partial coherence analyses of fMRI data. Neuroimage, 21, 647-658. Sun, Y., Farzan, F., Barr, M. S., Kirihara, K., Fitzgerald, P. B., Light, G. A. & Daskalakis, Z. J. (2011). gamma oscillations in schizophrenia: mechanisms and clinical significance. Brain Res, 1413, 98-114. Tang, L., Ge, Y., Sodickson, D. K., Miles, L., Zhou, Y., Reaume, J. & Grossman, R. I. (2011). Thalamic resting-state functional networks: disruption in patients with mild traumatic brain injury. Radiology, 260, 831-840. Zang, Y. F., He, Y., Zhu, C. Z., Cao, Q. J., Sui, M. Q., Liang, M., Tian, L. X., Jiang, T. Z. & Wang, Y. F. (2007). Altered baseline brain activity in children with ADHD revealed by resting-state functional MRI. Brain Dev, 29, 83-91. Zhang, G., Yin, H., Zhou, Y. L., Han, H. Y., Wu, Y. H., Xing, W., Xu, H. Z. & Zuo, X. N. (2012). Capturing amplitude changes of low-frequency fluctuations in functional magnetic resonance imaging signal: a pilot acupuncture study on NeiGuan (PC6). J Altern Complement Med, 18, 387-393. Zhou, Y., Milham, M. P., Lui, Y. W., Miles, L., Reaume, J., Sodickson, D. K., Grossman, R. I. & Ge, Y. (2012). Default-mode network disruption in mild traumatic brain injury. Radiology, 265, 882-892. Zou, Q., Long, X., Zuo, X., Yan, C., Zhu, C., Yang, Y., Liu, D., He, Y. & Zang, Y. (2009). Functional connectivity between the thalamus and visual cortex under eyes closed and eyes open conditions: a resting-state fMRI study. Hum Brain Mapp, 30, 3066-3078. Zou, Q. H., Zhu, C. Z., Yang, Y., Zuo, X. N., Long, X. Y., Cao, Q. J., Wang, Y. F. & Zang, Y. F. (2008). An improved approach to detection of amplitude of low-frequency fluctuation (ALFF) for resting-state fMRI: fractional ALFF. J Neurosci Methods, 172, 137-141. Zuo, X. N., Di Martino, A., Kelly, C., Shehzad, Z. E., Gee, D. G., Klein, D. F., Castellanos, F. X., Biswal, B. B. & Milham, M. P. (2010). The oscillating brain: complex and reliable. Neuroimage, 49, 1432-1445. Assaf, Y., Holokovsky, A., Berman, E., Shapira, Y., Shohami, E. & Cohen, Y. (1999). Diffusion and perfusion magnetic resonance imaging following closed head injury in rats. J Neurotrauma, 16, 1165-1176. Baumann, C. R., Werth, E., Stocker, R., Ludwig, S. & Bassetti, C. L. (2007). Sleep-wake disturbances 6 months after traumatic brain injury: a prospective study. Brain, 130, 1873-1883. Bendlin, B. B., Ries, M. L., Lazar, M., Alexander, A. L., Dempsey, R. J., Rowley, H. A., Sherman, J. E. & Johnson, S. C. (2008). Longitudinal changes in patients with traumatic brain injury assessed with diffusion-tensor and volumetric imaging. Neuroimage, 42, 503-514. Biswal, B., Yetkin, F. Z., Haughton, V. M. & Hyde, J. S. (1995). Functional connectivity in the motor cortex of resting human brain using echo-planar MRI. Magn Reson Med, 34, 537-541. Castriotta, R. J., Wilde, M. C., Lai, J. M., Atanasov, S., Masel, B. E. & Kuna, S. T. (2007). Prevalence and consequences of sleep disorders in traumatic brain injury. J Clin Sleep Med, 3, 349-356. Cauda, F., Micon, B. M., Sacco, K., Duca, S., D’Agata, F., Geminiani, G. & Canavero, S. (2009). Disrupted intrinsic functional connectivity in the vegetative state. J Neurol Neurosurg Psychiatry, 80, 429-431. Childers, M. K., Rupright, J., Jones, P. S. & Merveille, O. (1998). Assessment of neuroendocrine dysfunction following traumatic brain injury. Brain Inj, 12, 517-523. Cordes, D., Haughton, V. M., Arfanakis, K., Carew, J. D., Turski, P. A., Moritz, C. H., Quigley, M. A. & Meyerand, M. E. (2001). Frequencies contributing to functional connectivity in the cerebral cortex in “resting-state” data. AJNR Am J Neuroradiol, 22, 1326-1333. Damoiseaux, J. S., Rombouts, S. A., Barkhof, F., Scheltens, P., Stam, C. J., Smith, S. M. 7 Beckmann, C. F. (2006). Consistent resting-state networks across healthy subjects. Proc Natl Acad Sci USA, 103, 13848-13853. Delouche, A., Attye, A., Heck, O., Grand, S., Kastler, A., Lamalle, L., Renard, F. & Krainik, A. (2016). Diffusion MRI: Pitfalls, literature review and future directions of research in mild traumatic brain injury. Eur J Radiol, 85, 25-30. Fichtenberg, N. L., Zafonte, R. D., Putnam, S., Mann, N. R. & Millard, A. E. (2002). Insomnia in a post-acute brain injury sample. Brain Inj, 16, 197-206. Grossman, E. J., Ge, Y., Jensen, J. H., Babb, J. S., Miles, L., Reaume, J., Silver, J. M., Grossman, R. I. & Inglese, M. (2011). Thalamus and Cognitive Impairment in Mild Traumatic Brain Injury: A Diffusional Kurtosis Imaging Study. J Neurotrauma. Hahnel, S. & Herweh, C. (2015). MRI biomarkers in mild traumatic brain injury. Neurology, 84, 554-555. Hillary, F. G., Slocomb, J., Hills, E. C., Fitzpatrick, N. M., Medaglia, J. D., Wang, J., Good, D. C. & Wylie, G. R. (2011). Changes in resting connectivity during recovery from severe traumatic brain injury. Int J Psychophysiol. Jantzen, K. J. (2010). Functional magnetic resonance imaging of mild traumatic brain injury. J Head Trauma Rehabil, 25, 256-266. Jensen, J. H., Helpern, J. A., Ramani, A., Lu, H. & Kaczynski, K. (2005). Diffusional kurtosis imaging: the quantification of non-gaussian water diffusion by means of magnetic resonance imaging. Magn Reson Med, 53, 1432-1440. Kim, J., Whyte, J., Patel, S., Avants, B., Europa, E., Wang, J., Slattery, J., Gee, J. C., Coslett, H. B. & Detre, J. A. (2010). Resting cerebral blood flow alterations in chronic traumatic brain injury: an arterial spin labeling perfusion FMRI study. J Neurotrauma, 27, 1399-1411. Kolassa, I.T., Wienbruch, C., Neuner, F., Schauer, M., Ruf, M., Odenwald, M. & Elbert, T (2007). Altered oscillatory brain dynamics after repeated traumatic stress. BMC Psychiatry, 7, 56. Kraus, M. F., Susmaras, T., Caughlin, B. P., Walker, C. J., Sweeney, J. A. & Little, D.M. (2007). White matter integrity and cognition in chronic traumatic brain injury: a diffusion tensor imaging study. Brain, 130, 2508-2519. Krupp, L. B., LaRocca, N. G., Muir-Nash, J. & Steinberg, A. D. (1989). The fatigue severity scale. Application to patients with multiple sclerosis and systemic lupus erythematosus. Arch Neurol, 46, 1121-1123. Lipton, M. L., Gellella, E., Lo, C., Gold, T., Ardekani, B. A., Shifteh, K., Bello, J. A. & Branch, C. A. (2008). Multifocal white matter ultrastructural abnormalities in mild traumatic brain injury with cognitive disability: a voxel-wise analysis of diffusion tensor imaging. J Neurotrauma, 25, 1335-1342. Long, J. A., Watts, L. T., Chemello, J., Huang, S., Shen, Q. & Duong, T. Q. (2015). Multiparametric and longitudinal MRI characterization of mild traumatic brain injury in rats. J Neurotrauma, 32, 598-607. Mantini, D., Perrucci, M. G., Del Gratta, C., Romani, G. L. & Corbetta, M. (2007). Electrophysiological signatures of resting state networks in the human brain. Proc Natl Acad Sci U S A, 104, 13170-13175. Mayer, A. R., Mannell, M. V., Ling, J., Gasparovic, C. & Yeo, R. A. (2011). Functional connectivity in mild traumatic brain injury. Hum Brain Mapp. Nakashima, T, Nakayama, N, Miwa, K, Okumura, A, Soeda, A, Iwama, T (2007). Focal brain glucose hypometabolism in patients with neuropsychologic deficits after diffuse axonal injury. AJNR Am J Neuroradiol, 28, 236-242. Nunez, A., Rodrigo-Angulo, M. L., Andres, I. D. & Garzon, M. (2009). Hypocretin/Orexin neuropeptides: participation in the control of sleep-wakefulness cycle and energy homeostasis. Curr Neuropharmacol, 7, 50-59. Petchprapai, N. & Winkelman, C. (2007). Mild traumatic brain injury: determinants and subsequent quality of life. A review of the literature. J Neurosci Nurs, 39, 260-272. Smith, D. H., Meaney, D. F. & Shull, W. H. (2003). Diffuse axonal injury in head trauma. J Head Trauma Rehabil, 18, 307-316. Stokum, J. A., Sours, C., Zhuo, J., Kane, R., Shanmuganathan, K. & Gullapalli, R. P. (2015). A longitudinal evaluation of diffusion kurtosis imaging in patients with mild traumatic brain injury. Braiin Inj, 29, 47–57. Tabesh, A., Jensen, J. H., Ardekani, B. A. & Helpern, J. A. (2011). Estimation of tensors and tensor-derived measures in diffusional kurtosis imaging. Magn Reson Med, 65, 823-836. Wong, P. K. (2015). Susceptibility-weighted MRI in mild traumatic brain injury. Neurology, 85, 921. Wu, X., Kirov, II., Gonen, O., Ge, Y., Grossman, R. I. & Lui, Y. W. (2016). MR imaging applications in mild traumatic brain injury: an imaging update. Radiology, 279, 693–707. Yount, R., Raschke, K. A., Biru, M., Tate, D. F., Miller, M. J., Abildskov, T., Gandhi, P., Ryser, D., Hopkins, R. O. & Bigler, E. D. (2002). Traumatic brain injury and atrophy of the cingulate gyrus. J Neuropsychiatry Clin Neurosci, 14, 416-423. Zhou, Y., Lui, Y. W., Zuo, X. N., Milham, M. P., Reaume, J., Grossman, R. I. & Ge, Y. (2014). Characterization of thalamo-cortical association using amplitude and connectivity of functional MRI in mild traumatic brain injury. J Magn Reson Imaging, 39, 1558-1568. Zhou, Y., Kierans, A., Kenul, D., Ge, Y., Rath, J., Reaume, J., Grossman, R. I. & Lui, Y. W. (2013). Mild traumatic brain injury: longitudinal regional brain volume changes. Radiology, 267, 880-890. Sakurai, T., Amemiya, A., Ishii, M., et al. (1998). Orexins and orexin receptors: a family of hypothalamic neuropeptides and G protein-coupled receptors that regulate feeding behavior. Cell, 92(5), 1 page following 696.
	de Lecea, L., Kilduff, T. S., Peyron, C., et al. (1998). The hypocretins: hypothalamus-specific peptides with neuroexcitatory activity. Proc Natl Acad Sci U S A, 95(1), 322-327. Schur, E. A., Kleinhans, N. M., Goldberg, J., Buchwald, D., Schwartz, M. W. & Maravilla, K. (2009). Activation in brain energy regulation and reward centers by food cues varies with choice of visual stimulus. Int J Obes (Lond), 33(6), 653-661. Killgore, W. D., Young, A. D., Femia, L. A., Bogorodzki, P., Rogowska, J. & Yurgelun-Todd, D. A. (2003). Cortical and limbic activation during viewing of high- versus low-calorie foods. Neuroimage, 19(4), 1381-1394. Zhou, Y., Lui, Y. W., Zuo, X. N., et al. Characterization of thalamo-cortical association using amplitude and connectivity of functional MRI in mild traumatic brain injury. J Magn Reson Imaging, 39(6), 1558-1568. Andrews-Hanna, J. R., Reidler, J. S., Sepulcre, J., Poulin, R. & Buckner, R. L. (2010). Functional-anatomic fractionation of the brain’s default network. Neuron, 65, 550-562. Aubry, M., Cantu, R., Dvorak, J., Graf-Baumann, T., Johnston, K., Kelly, J., Lovell, M., McCrory, P., Meeuwisse, W. & Schamasch, P. (2002). Summary and agreement statement of the First International Conference on Concussion in Sport, Vienna 2001. Recommendations for the improvement of safety and health of athletes who may suffer concussive injuries. Br J Sports Med, 36, 6-10. Bazarian, J. J., Zhong, J., Blyth, B., Zhu, T., Kavcic, V. & Peterson, D. (2007). Diffusion tensor imaging detects clinically important axonal damage after mild traumatic brain injury: a pilot study. J Neurotrauma, 24, 1447-1459. Beck, A. T., Ward, C. H., Mendelson, M., Mock, J. & Erbaugh, J. (1961). An inventory for measuring depression. Arch Gen Psychiatry, 4, 561-571. Beckmann, C. F., DeLuca, M., Devlin, J. T. & Smith, S. M. (2005). Investigations into resting-state connectivity using independent component analysis. Philos Trans R Soc Lond B Biol Sci, 360, 1001-1013. Beckmann, C. F. & Smith, S. M. (2005). Tensorial extensions of independent component analysis for multisubject FMRI analysis. Neuroimage, 25, 294-311. Bell, A. J. & Sejnowski, T. J. (1995). An Information Maximization Approach to Blind Separation and Blind Deconvolution. Neural Comput, 7, 1129-1159. Bennett, C. M., Wolford, G. L. & Miller, M. B. (2009). The principled control of false positives in neuroimaging. Soc Cogn Affect Neurosci, 4(4), 417–422. Boly, M., Phillips, C., Tshibanda, L., Vanhaudenhuyse, A., Schabus, M., Dang-Vu, T. T., Moonen, G., Hustinx, R., Maquet, P. & Laureys, S. (2008). Intrinsic brain activity in altered states of consciousness: how conscious is the default mode of brain function? Ann N Y Acad Sci, 1129, 119-129. Borg, J., Holm, L., Cassidy, J. D., Peloso, P. M., Carroll, L. J., von Holst, H. & Ericson, K. (2004). Diagnostic procedures in mild traumatic brain injury: results of the WHO Collaborating Centre Task Force on Mild Traumatic Brain Injury. J Rehabil Med, 61-75. Broyd, S. J., Demanuele, C., Debener, S., Helps, S. K., James, C. J. & Sonuga-Barke, E. J. (2009). Default-mode brain dysfunction in mental disorders: a systematic review. Neurosci Biobehav Rev, 33, 279-296. Buckner, R. L., Andrews-Hanna, J. R. & Schacter, D. L. (2008). The brain’s default network: anatomy, function, and relevance to disease. Ann N Y Acad Sci, 1124, 1-38. Chen, J. K., Johnston, K. M., Collie, A., McCrory, P. & Ptito, A. (2007). A validation of the post concussion symptom scale in the assessment of complex concussion using cognitive testing and functional MRI. J Neurol Neurosurg Psychiatry, 78, 1231-1238. Christodoulou, C., DeLuca, J., Ricker, J. H., Madigan, N. K., Bly, B. M., Lange, G., Kalnin, A. J., Liu, W. C., Steffener, J., Diamond, B. J. & Ni, A. C. (2001). Functional magnetic resonance imaging of working memory impairment after traumatic brain injury. J Neurol Neurosurg Psychiatry, 71, 161-168. Cicerone, K. D. (2002). Remediation of “working attention” in mild traumatic brain injury. Brain Inj, 16, 185-195. Daniels, J. K., McFarlane, A. C., Bluhm, R. L., Moores, K. A., Clark, C. R., Shaw, M. E., Williamson, P. C., Densmore, M. & Lanius, R. A. (2010). Switching between executive and default mode networks in posttraumatic stress disorder: alterations in functional connectivity. J Psychiatry Neurosci, 35, 258-266. DC Delis, J. K., Kaplan, E. & Ober, B. A. (2000). California Verbal Learning Test. Adult Version. Manual (2nd edition). San Antonio, TX: The Psychological Corporation. De Luca, M., Beckmann, C. F., De Stefano, N., Matthews, P. M. & Smith, S. M. (2006). fMRI resting state networks define distinct modes of long-distance interactions in the human brain. Neuroimage, 29, 1359-1367. Dice, L. R. (1945). Measures of the Amount of Ecologic Association between Species. Ecology, 26, 297-302. Fox, M. D. & Raichle, M. E. (2007). Spontaneous fluctuations in brain activity observed with functional magnetic resonance imaging. Nature Reviews Neuroscience, 8, 700-711. Greicius, M. D., Flores, B. H., Menon, V., Glover, G. H., Solvason, H. B., Kenna, H., Reiss, A. L. & Schatzberg, A. F. (2007). Resting-state functional connectivity in major depression: abnormally increased contributions from subgenual cingulate cortex and thalamus. Biol Psychiatry, 62, 429-437. Greicius, M. D., Krasnow, B., Reiss, A. L. & Menon, V. (2003). Functional connectivity in the resting brain: a network analysis of the default mode hypothesis. Proc Natl Acad Sci U S A, 100, 253-258. Greicius, M. D., Srivastava, G., Reiss, A. L. & Menon, V. (2004). Default-mode network activity distinguishes Alzheimer’s disease from healthy aging: evidence from functional MRI. Proc Natl Acad Sci U S A, 101, 4637-4642. Greicius, M. D., Supekar, K., Menon, V. & Dougherty, R. F. (2009). Resting-state functional connectivity reflects structural connectivity in the default mode network. Cereb Cortex, 19, 72-78. Gusnard, D. A. & Raichle, M. E. (2001). Searching for a baseline: functional imaging and the resting human brain. Nat Rev Neurosci, 2, 685-694. Halterman, C. I., Langan, J., Drew, A., Rodriguez. E., Osternig, L. R., Chou, L. S. & van Donkelaar, P. (2006). Tracking the recovery of visuospatial attention deficits in mild traumatic brain injury. Brain, 129, 747-753. Inglese, M., Makani, S., Johnson, G., Cohen, B. A., Silver, J. A., Gonen, O. & Grossman, R. I. (2005). Diffuse axonal injury in mild traumatic brain injury: a diffusion tensor imaging study. J Neurosurg, 103, 298-303. Johnson, M. K., Raye, C. L., Mitchell, K. J., Touryan, S. R., Greene, E. J. & Nolen-Hoeksema, S. (2006). Dissociating medial frontal and posterior cingulate activity during self-reflection. Soc Cogn Affect Neurosci, 1, 56-64. Jones, D. T., Machulda, M. M., Vemuri, P., McDade, E. M., Zeng, G., Senjem, M. L., Gunter, J. L., Przybelski, S. A., Avula, R. T., Knopman, D. S., Boeve, B. F., Petersen, R. C. & Jack, C. R. Jr. (2011). Age-related changes in the default mode network are more advanced in Alzheimer disease. Neurology, 77, 1524-1531. Kelly, R. E., Wang, Z., Alexopoulos, G. S., Gunning, F. M., Murphy, C. F., Morimoto, S. S., Kanellopoulos, D., Jia, Z., Lim, K. O. & Hoptman, M. J. (2010). Hybrid ICA-Seed-Based Methods for fMRI Functional Connectivity Assessment: A Feasibility Study. Int J Biomed Imaging, 2010. Lee, T. W., Girolami, M. & Sejnowski, T. J. (1999). Independent component analysis using an extended infomax algorithm for mixed subgaussian and supergaussian sources. Neural Comput, 11, 417-441. Levine, B., Kovacevic, N., Nica, E. I., Cheung, G., Gao, F., Schwartz, M. L. & Black, S. E. (2008). The Toronto traumatic brain injury study: injury severity and quantified MRI. Neurology, 70, 771-778. Lux, W. E. (2007). A neuropsychiatric perspective on traumatic brain injury. J Rehabil Res Dev, 44, 951-962. Ma, L., Wang, B., Chen, X. & Xiong, J. (2007). Detecting functional connectivity in the resting brain: a comparison between ICA and CCA. Magn Reson Imaging, 25, 47-56. Meyers, JMaK. (1995). Rey Complex Figure Test and Recognition Trial: Professional manual. Odessa, FL: Psychological Assessment Resources, Inc.
Raichle, M. E., MacLeod, A. M., Snyder, A. Z., Powers, W. J., Gusnard, D. A. & Shulman, G. L. (2001). A default mode of brain function. Proc Natl Acad Sci U S A, 98, 676-682. Raichle, M. E. & Snyder, A. Z. (2007). A default mode of brain function: a brief history of an evolving idea. Neuroimage, 37, 1083-1090, discussion 1097-1089. Reitan, R. (1992). Trail Making Test: Manual for Administration and Scoring. Ariz: Reitan Neuropsychology Laboratory. Rocca, M. A., Valsasina, P., Absinta, M., Riccitelli, G., Rodegher, M. E., Misci, P., Rossi, P., Falini, A., Comi, G. & Filippi, M. (2010). Default-mode network dysfunction and cognitive impairment in progressive MS. Neurology, 74, 1252-1259. Rombouts, S. A., Barkhof, F., Hoogenraad, F. G., Sprenger, M., Valk, J. & Scheltens, P. (1997). Test-retest analysis with functional MR of the activated area in the human visual cortex. AJNR Am J Neuroradiol, 18, 1317-1322. Rutland-Brown, W., Langlois, J. A. Thomas, K. E. & Xi, Y. L. (2006). Incidence of traumatic brain injury in the United States, 2003. J Head Trauma Rehabil, 21, 544-548. Scheibel, R. S., Newsome, M. R., Steinberg, J. L., Pearson, D. A., Rauch, R. A., Mao, H., Troyanskaya, M., Sharma, R. G. & Levin, H. S. (2007). Altered brain activation during cognitive control in patients with moderate to severe traumatic brain injury. Neurorehabil Neural Repair, 21, 36-45. Sharp, D. J., Beckmann, C. F., Greenwood, R., Kinnunen, K. M., Bonnelle, V., De Boissezon, X., Powell, J. H., Counsell, S. J., Patel, M. C. & Leech, R. (2011). Default mode network functional and structural connectivity after traumatic brain injury. Brain, 134, 2233-2247. Shulman, G. L., Corbetta, M., Fiez, J. A., Buckner, R. L., Miezin, F. M., Raichle, M. E. & Petersen, S. E. (1997). Searching for activations that generalize over tasks. Hum Brain Mapp, 5, 317-322. Smith, A. (1973). Symbol Digit Modalities Test Manual. Los Angeles: Western Psychological Services. Sosin, D. M., Sniezek, J. E. & Thurman, D. J. (1996). Incidence of mild and moderate brain injury in the United States, 1991. Brain Inj, 10, 47-54. Uddin, L. Q., Kelly, A. M., Biswal, B. B., Xavier Castellanos, F. & Milham, M. P. (2009). Functional connectivity of default mode network components: correlation, anticorrelation, and causality. Hum Brain Mapp, 30, 625-637.
van de Ven, V. G., Formisano, E., Prvulovic, D., Roeder, C. H. & Linden, D. E. J. (2004). Functional connectivity as revealed by spatial independent component analysis of fMRI measurements during rest. Human Brain Mapping, 22, 165-178. Vanhaudenhuyse, A., Noirhomme, Q., Tshibanda, L. J., Bruno, M. A., Boveroux, P., Schnakers, C., Soddu, A., Perlbarg, V., Ledoux, D., Brichant, J. F., Moonen, G., Maquet, P., Greicius, M. D., Laureys, S. & Boly, M. (2010). Default network connectivity reflects the level of consciousness in non-communicative brain-damaged patients. Brain, 133, 161-171. Vialatte, F. B. & Cichocki, A. (2008). Split-test Bonferroni correction for QEEG statistical maps. Biol Cybern, 98, 295-303. Wechsler, D. (1985). Wechsler Adult Intelligence Scale-III. New York: The Psychological Corporation. Zhang, D. & Raichle M. E. (2010). Disease and the brain’s dark energy. Nat Rev Neurol, 6, 15-28. Zhang, Z., Lu, G., Zhong, Y., Tan, Q., Liao, W., Wang, Z., Li, K., Chen, H. & Liu, Y. (2010). Altered spontaneous neuronal activity of the default-mode network in mesial temporal lobe epilepsy. Brain Res, 1323, 152-160. Zhao, X. H., Wang, P. J., Li, C. B., Hu, Z. H., Xi, Q., Wu, W. Y. & Tang, X. W. (2007). Altered default mode network activity in patient with anxiety disorders: an fMRI study. Eur J Radiol, 63, 373-378. Zuo, X. N., Kelly, C., Adelstein J. S., Klein D. F., Castellanos, F. X. & Milham, M. P. (2010). Reliable intrinsic connectivity networks: test-retest evaluation using ICA and dual regression approach. Neuroimage, 49, 2163-2177. Achard, S., Salvador, R., Whitcher, B., Suckling, J. & Bullmore, E. (2006). A resilient, low-frequency, small-world human brain functional network with highly connected association cortical hubs. J Neurosci, 26, 63-72. Bharath, R. D., Munivenkatappa, A., Gohel, S., Panda, R., Saini, J., Rajeswaran, J., Shukla, D., Bhagavatula, I. D. & Biswal, B. B. (2015). Recovery of resting brain connectivity ensuing mild traumatic brain injury. Front Hum Neurosci, 9, 513. Caeyenberghs, K., Leemans, A., De Decker, C., Heitger, M., Drijkoningen, D., Linden, C. V., Sunaert, S. & Swinnen, S. P. (2012). Brain connectivity and postural control in young traumatic brain injury patients: A diffusion MRI based network analysis. Neuroimage Clin, 1, 106-115. Cao, C. & Slobounov, S. (2010). Alteration of cortical functional connectivity as a result of traumatic brain injury revealed by graph theory, ICA, and sLORETA analyses of EEG signals. IEEE Trans Neural Syst Rehabil Eng, 18, 11-19. Chen, Z. J., He, Y., Rosa-Neto, P., Germann, J. & Evans, A. C. (2008). Revealing modular architecture of human brain structural networks by using cortical thickness from MRI. Cereb Cortex, 18, 2374-2381. Deuker, L., Bullmore, E. T., Smith, M., Christensen, S., Nathan, P. J., Rockstroh, B. & Bassett, D. S. (2009). Reproducibility of graph metrics of human brain functional networks. Neuroimage, 47, 1460-1468. Drzezga, A., Becker, J. A., Van Dijk, K. R., Sreenivasan, A., Talukdar, T., Sullivan, C., Schultz, A. P., Sepulcre, J., Putcha, D., Greve, D., Johnson, K. A. & Sperling, R. A. (2011). Neuronal dysfunction and disconnection of cortical hubs in non-demented subjects with elevated amyloid burden. Brain, 134, 1635-1646. Gong, Y. & Zhang, Z. (2009). Global robustness and identifiability of random, scale-free, and small-world networks. Ann N Y Acad Sci, 1158, 82-92. Gultekin, S. H. & Smith, T. W. (1994). Diffuse axonal injury in craniocerebral trauma. A comparative histologic and immunohistochemical study. Arch Pathol Lab Med, 118, 168-171. Hagmann, P., Cammoun, L., Gigandet, X., Meuli, R., Honey, C. J., Wedeen, V. J. & Sporns, O. (2008). Mapping the structural core of human cerebral cortex. PLoS Biol, 6, e159. He, Y., Chen, Z. J. & Evans, A. C. (2007). Small-world anatomical networks in the human brain revealed by cortical thickness from MRI. Cereb Cortex, 17, 2407-2419. Hellyer, P. J., Scott, G., Shanahan, M., Sharp, D. J. & Leech, R. (2015). Cognitive Flexibility through Metastable Neural Dynamics Is Disrupted by Damage to the Structural Connectome. J Neurosci, 35, 9050-9063. Hilgetag, C. C. & Goulas, A. (2016). Is the brain really a small-world network? Brain Struct Funct, 221, 2361-2366. Iraji, A., Chen, H., Wiseman, N., Zhang, T., Welch, R., O’Neil, B., Kulek, A., Ayaz, S. I., Wang, X., Zuk, C., Haacke, E. M., Liu, T. & Kou, Z. (2016). Connectome-scale assessment of structural and functional connectivity in mild traumatic brain injury at the acute stage. Neuroimage Clin, 12, 100-115. Johnson, B., Gay, M., Zhang, K., Neuberger, T., Horovitz, S. G., Hallett, M., Sebastianelli, W. & Slobounov, S. (2012). The use of magnetic resonance spectroscopy in the subacute evaluation of athletes recovering from single and multiple mild traumatic brain injury. J Neurotrauma, 29, 2297-2304. Mayer, A. R., Ling, J. M., Allen, E. A., Klimaj, S. D., Yeo, R. A. & Hanlon, F. M. (2015). Static and Dynamic Intrinsic Connectivity following Mild Traumatic Brain Injury. J Neurotrauma, 32, 1046-1055. Min, Y. S., Chang, Y., Park, J. W., Lee, J. M., Cha, J., Yang, J. J., Kim, C. H., Hwang, J. M., Yoo, J. N. & Jung, T. D. (2015). Change of Brain Functional Connectivity in Patients With Spinal Cord Injury: Graph Theory Based Approach. Ann Rehabil Med, 39, 374-383. Pandit, A. S., Expert, P., Lambiotte, R., Bonnelle, V., Leech, R., Turkheimer, F. E. & Sharp, D. J. (2013). Traumatic brain injury impairs small-world topology. Neurology, 80, 1826-1833. Pavlopoulos, G. A., Secrier, M., Moschopoulos, C. N., Soldatos, T. G., Kossida, S., Aerts, J., Schneider, R. & Bagos, P. G. (2011). Using graph theory to analyze biological networks. BioData Min, 4, 10. Peeters, S. C., Gronenschild, E. H., van Amelsvoort, T., van Os, J., Marcelis, M., Genetic, R., Outcome of, P., Kahn, R., Wiersma, D., Bruggeman, R., Cahn, W., de Haan, L., Meijer, C. & Myin-Germeys, I. (2016). Reduced specialized processing in psychotic disorder: a graph theoretical analysis of cerebral functional connectivity. Brain Behav, 6, e00508. Pontifex, M. B., Broglio, S. P., Drollette, E. S., Scudder, M. R., Johnson, C. R., O’Connor, P. M. & Hillman, C. H. (2012). The relation of mild traumatic brain injury to chronic lapses of attention. Res Q Exerc Sport, 83, 553-559. Sanz-Arigita, E. J., Schoonheim, M. M., Damoiseaux, J. S., Rombouts, S. A., Maris, E., Barkhof, F., Scheltens, P. & Stam, C. J. (2010). Loss of ‘small-world’ networks in Alzheimer’s disease: graph analysis of FMRI resting-state functional connectivity. PLoS One, 5, e13788. Shu, N., Liu, Y., Li, K., Duan, Y., Wang, J., Yu, C., Dong, H., Ye, J. & He, Y. (2011). Diffusion Tensor Tractography Reveals Disrupted Topological Efficiency in White Matter Structural Networks in Multiple Sclerosis. Cereb Cortex. Smith, C. J., Johnson, B. N., Elkind, J. A., See, J. M., Xiong, G. & Cohen, A. S. (2012). Investigations on alterations of hippocampal circuit function following mild traumatic brain injury. J Vis Exp, e4411. Sours, C., Zhuo, J., Roys, S., Shanmuganathan, K. & Gullapalli, R. P. (2015). Disruptions in Resting State Functional Connectivity and Cerebral Blood Flow in Mild Traumatic Brain Injury Patients. PLoS One, 10, e0134019. Stam, C. J., de Haan, W., Daffertshofer, A., Jones, B. F., Manshanden, I., van Cappellen van Walsum, A. M., Montez, T., Verbunt, J. P., de Munck, J. C., van Dijk, B. W., Berendse, H. W. & Scheltens, P. (2009). Graph theoretical analysis of magnetoencephalographic functional connectivity in Alzheimer’s disease. Brain, 132, 213-224.
van den Heuvel, M. P. & Hulshoff, Pol H. E. (2010). Exploring the brain network: a review on resting-state fMRI functional connectivity. Eur Neuropsychopharmacol, 20, 519-534. Voets, N. L., Menke, R. A., Jbabdi, S., Husain, M., Stacey, R., Carpenter, K. & Adcock, J. E. (2015). Thalamo-Cortical Disruption Contributes to Short-Term Memory Deficits in Patients with Medial Temporal Lobe Damage. Cereb Cortex, 25, 4584-4595. Wang, L., Goldstein, F. C., Veledar, E., Levey, A. I., Lah, J. J., Meltzer, C. C., Holder, C. A. & Mao, H. (2009). Alterations in cortical thickness and white matter integrity in mild cognitive impairment measured by whole-brain cortical thickness mapping and diffusion tensor imaging. AJNR Am J Neuroradiol, 30, 893-899. Watts, D. J. & Strogatz, S. H. (1998). Collective dynamics of ‘small-world’ networks. Nature, 393, 440-442. Whitlow, C. T., Casanova, R. & Maldjian, J. A. (2011). Effect of resting-state functional MR imaging duration on stability of graph theory metrics of brain network connectivity. Radiology, 259, 516-524. Wu, X., Kirov, II., Gonen, O., Ge, Y., Grossman, R. I. & Lui, Y. W. (2016). MR Imaging Applications in Mild Traumatic Brain Injury: An Imaging Update. Radiology, 279(3), 693-707. Zavaglia, M. & Hilgetag, C. C. (2016). Causal functional contributions and interactions in the attention network of the brain: an objective multi-perturbation analysis. Brain Struct Funct, 221, 2553-2568. Zhou, Y. (2016). Abnormal structural and functional hypothalamic connectivity in mild traumatic brain injury. J Magn Reson Imaging, DOI: 10.1002/jmri.25548. Zhou, Y., Kierans, A., Kenul, D., Ge, Y., Rath, J., Reaume, J., Grossman, R. I. & Lui, Y. W. (2013a). Mild traumatic brain injury: longitudinal regional brain volume changes. Radiology, 267, 880-890. Zhou, Y. & Lui, Y. W. (2013b). Small-World Properties in Mild Cognitive Impairment and Early Alzheimer’s Disease: A Cortical Thickness MRI Study. ISRN Geriatr 542080. Alexander, M. (1997). Minor Traumatic Brain Injury: A Review of Physiogenesis and Psychogenesis Semin Clin Neuropsychiatry, 2, 177-187. Battiti, R. (1994). Using mutual information for selecting features in supervised neural net learning. IEEE Trans Neural Netw, 5, 537-550. Bigler, E. D. (2008). Neuropsychology and clinical neuroscience of persistent post-concussive syndrome. J Int Neuropsychol Soc, 14, 1-22. Chu, Z., Wilde, E. A., Hunter, J. V., McCauley, S. R., Bigler, E. D., Troyanskaya, M., Yallampalli, R., Chia, J. M. & Levin, H. S. (2010). Voxel-based analysis of diffusion tensor imaging in mild traumatic brain injury in adolescents. AJNR Am J Neuroradiol, 31, 340-346. Fox, M. D. & Raichle, M. E. (2007). Spontaneous fluctuations in brain activity observed with functional magnetic resonance imaging. Nat Rev Neurosci, 8, 700-711. Grossman, E. J., Ge, Y., Jensen, J. H., Babb, J. S., Miles, L., Reaume, J., Silver, J. M., Grossman, R. I. & Inglese, M. (2012). Thalamus and cognitive impairment in mild traumatic brain injury: a diffusional kurtosis imaging study. J Neurotrauma, 29, 2318-2327. Hudak, A., Warner, M., Marquez de la Plata, C., Moore, C., Harper, C. & Diaz-Arrastia, R. (2011). Brain morphometry changes and depressive symptoms after traumatic brain injury. Psychiatry Res, 191, 160-165. Kirov, II., Patil, V., Babb, J. S., Rusinek, H., Herbert, J. & Gonen, O. (2009). MR spectroscopy indicates diffuse multiple sclerosis activity during remission. J Neurol Neurosurg Psychiatry, 80, 1330-1336. Little DM, Geary EK, Moynihan M, Alexander A, Pennington M, Glang P, Schulze ET, Dretsch M, Pacifico A, Davis ML, Stevens AB, Huang JH (2014) Imaging chronic traumatic brain injury as a risk factor for neurodegeneration. Alzheimers Dement 10:S188-195. Little, D. M., Kraus, M. F., Joseph, J., Geary, E. K., Susmaras, T., Zhou, X. J., Pliskin, N. & Gorelick, P. B. (2010). Thalamic integrity underlies executive dysfunction in traumatic brain injury. Neurology, 74, 558-564. Llinas, R. R., Ribary, U., Jeanmonod, D., Kronberg, E. & Mitra, P. P. (1999). Thalamocortical dysrhythmia: A neurological and neuropsychiatric syndrome characterized by magneto-encephalography. Proc Natl Acad Sci U S A, 96, 15222-15227. McAllister, T. W., Sparling, M. B., Flashman, L. A., Guerin, S. J., Mamourian, A. C. & Saykin, A. J. (2001). Differential working memory load effects after mild traumatic brain injury. Neuroimage, 14, 1004-1012. McCrea, M., Iverson, G. L., McAllister, T. W., Hammeke, T. A., Powell, M. R., Barr, W. B. & Kelly, J. P. (2009). An integrated review of recovery after mild traumatic brain injury (MTBI): implications for clinical management. Clin Neuropsychol, 23, 1368-1390. Ruff, R. M., Iverson, G. L., Barth, J. T., Bush, S. S., Broshek, D. K., Policy, N. A. N. & Planning, C. (2009). Recommendations for diagnosing a mild traumatic brain injury: a National Academy of Neuropsychology education paper. Arch Clin Neuropsychol, 24, 3-10. Zhou, Y. (2016). Small world properties changes in mild traumatic brain injury. J Magn Reson Imaging, DOI: 10.1002/jmri.25548. Zhou, Y. (2017). Abnormal structural and functional hypothalamic connectivity in mild traumatic brain injury. J Magn Reson Imaging, 45, 1105-1112. Rutland-Brown, W., Langlois, J. A., Thomas, K. E. & Xi, Y. L. (2006). Incidence of traumatic brain injury in the United States, 2003. J Head Trauma Rehabil, 21(6), 544–548. Sosin, D. M., Sniezek, J. E. & Thurman, D. J. (1996). Incidence of mild and moderate brain injury in the United States, 1991. Brain Inj, 10(1), 47–54. Smits, M., Hunink, M. G., van Rijssel, D. A., et al. (2008). Outcome after complicated minor head injury. AJNR Am J Neuroradiol, 29(3), 506–513. Kraus, J. F. & McArthur, D. L. (1996). Epidemiologic aspects of brain injury. Neurol Clin, 14(2), 435–450. Sorenson, S. B. & Kraus, J. F. (1991). Occurrence, severity and outcomes of brain injury. J Head Trauma Rehabil, 6(2), 1–12. Barth, J. T., Macciocchi, S. N., Giordani, B., Rimel, R., Jane, J. A. & Boll, T. J. (1983). Neuropsychological sequelae of minor head injury. Neurosurgery, 13(5), 529–533. McAllister, T. W. (1992). Neuropsychiatric sequelae of head injuries. Psychiatr Clin North Am, 15(2), 395–413. Alexander, M. P. (1997). Minor traumatic brain injury: a review of physiogenesis and psychogenesis. Semin Clin Neuropsychiatry, 2(3), 177–187. Dikmen, S., McLean, A. & Temkin, N. (1986). Neuropsychological and psychosocial consequences of minor head injury. J Neurol Neurosurg Psychiatry, 49(11), 1227–1232. Anderson, C. V. & Bigler, E. D. (1994). The role of caudate nucleus and corpus callosum atrophy in trauma-induced anterior horn dilation. Brain Inj, 8(6), 565–569. Anderson, C. V., Wood, D. M., Bigler, E. D. & Blatter, D. D. (1996). Lesion volume, injury severity, and thalamic integrity following head injury. J Neurotrauma, 13(1), 35–40. Bigler, E. D., Blatter, D. D., Anderson, C. V., et al. (1997). Hippocampal volume in normal aging and traumatic brain injury. AJNR Am J Neuroradiol, 18(1), 11–23. Gale, S. D., Burr, R. B., Bigler, E. D. & Blatter, D. (1993). Fornix degeneration and memory in traumatic brain injury. Brain Res Bull, 32(4), 345–349. Yount, R., Raschke, K. A., Biru, M., et al. (2002). Traumatic brain injury and atrophy of the cingulate gyrus. J Neuropsychiatry Clin Neurosci, 14(4), 416–423. McKee, A. C., Cantu, R. C., Nowinski, C. J., et al. (2009). Chronic traumatic encephalopathy in athletes: progressive tauopathy after repetitive head injury. J Neuropathol Exp Neurol, 68(7), 709–735. Stern, R. A., Riley, D. O., Daneshvar, D. H., Nowinski, C. J., Cantu, R. C. & McKee, A. C. (2011). Long-term consequences of repetitive brain trauma: chronic traumatic encephalopathy. PMR, 3(10 Suppl 2), S460–S467. Grossman, E. J., Ge, Y., Jensen, J. H., et al. (2012). Thalamus and cognitive impairment in mild traumatic brain injury: a diffusional kurtosis imaging study. J Neurotrauma, 29(13), 2318–2327. Raz, E., Jensen, J. H., Ge, Y., et al. (2011). Brain iron quantification in mild traumatic brain injury: a magnetic field correlation study. AJNR Am J Neuroradiol, 32(10), 1851–1856. Tang, L., Ge, Y., Sodickson, D. K., et al. (2011). Thalamic resting-state functional networks: disruption in patients with mild traumatic brain injury. Radiology, 260(3), 831–840. Zhou, Y., Milham, M. P., Lui, Y. W., et al. (2012). Default-mode network disruption in mild traumatic brain injury. Radiology, 265(3), 882–892. Kay, T., Harrington, D. E. & Adams, R. (1993). Definition of mild traumatic brain injury. J Head Trauma Rehabil, 8(3), 86–87. Petchprapai, N. & Winkelman, C. (2007). Mild traumatic brain injury: determinants and subsequent quality of life: a review of the literature. J Neurosci Nurs, 39(5), 260–272. Freeborough, P. A. & Fox, N. C. (1997). The boundary shift integral: an accurate and robust measure of cerebral volume changes from registered repeat MRI. IEEE Trans Med Imaging, 16(5), 623–629. Leung, K. K., Clarkson, M. J., Bartlett, J. W., et al. (2010). Robust atrophy rate measurement in Alzheimer’s disease using multi-site serial MRI: tissue-specific intensity normalization and parameter selection. Neuroimage, 50(2), 516–523. Fischl, B., Salat, D. H., Busa, E., et al. (2002). Whole brain segmentation: automated labeling of neuroanatomical structures in the human brain. Neuron, 33(3), 341–355. Destrieux, C., Fischl, B., Dale, A. & Halgren, E. (2010). Automatic parcellation of human cortical gyri and sulci using standard anatomical nomenclature. Neuroimage, 53(1), 1–15. Fischl, B., van der Kouwe, A., Destrieux, C., et al. (2004). Automatically parcellating the human cerebral cortex. Cereb Cortex, 14(1), 11–22. Salat, D. H., Greve, D. N., Pacheco, J. L., et al. (2009). Regional white matter volume differences in nondemented aging and Alzheimer’s disease. Neuroimage, 44(4), 1247–1258. Reuter, M., Schmansky, N. J., Rosas, H. D. & Fischl, B. (2012). Within-subject template estimation forunbiased longitudinal image analysis. Neuroimage, 61(4), 1402–1418. Reuter, M. & Fischl, B. (2011). Avoiding asymmetry-induced bias in longitudinal image processing. Neuroimage, 57(1), 19–21. Reuter, M., Rosas, H. D. & Fischl, B. (2010). Highly accurate inverse consistent registration: a robust approach. Neuroimage, 53(4), 1181– 1196. Smith, A. (1973). Symbol Digit Modalities Test manual. Los Angeles, Calif: Western Psychological Services. Wechsler, D. (1985). Wechsler Adult Intelligence Scale-III. New York, NY: The Psychological Corporation. Reitan, R. (1992). Trail Making Test: manual for administration and scoring. Tucson, Ariz: Reitan Neuropsychology Laboratory. Delis, D. C., Kramer, J. H., Kaplan, E. & Ober, B. A. (2000). California Verbal Learning Test. Adult Version. Manual. 2nd ed. San Antonio, Tex: The Psychological Corporation. Meyers, J. E. & Meyers, K. R. (1995). Rey Complex Figure Test and Recognition Trial: professional manual. Odessa, Fla: Psychological Assessment Resources. Gronwall, D. & Wrightson, P. (1974). Delayed recovery of intellectual function after minor head injury. Lancet, 2(7881), 605–609. Beck, A. T., Epstein, N., Brown, G. & Steer, R. A. (1988). An inventory for measuring clinical anxiety: psychometric properties. J Consult Clin Psychol, 56(6), 893–897. Beck, A. T., Ward, C. H., Mendelson, M., Mock, J. & Erbaugh, J. (1961). An inventory for measuring depression. Arch Gen Psychiatry, 4, 561– 571. Krupp, L. B., LaRocca, N. G., Muir-Nash, J. & Steinberg, A. D. (1989). The fatigue severity scale: application to patients with multiple sclerosis and systemic lupus erythematosus. Arch Neurol, 46(10), 1121–1123. Aubry, M., Cantu, R., Dvorak, J., et al. (2002). Summary and agreement statement of the First International Conference on Concussion in Sport, Vienna 2001: recommendations for the improvement of safety and health of athletes who may suffer concussive injuries. Br J Sports Med, 36(1), 6–10. Chen, J. K., Johnston, K. M., Collie, A., McCrory, P. & Ptito, A. (2007). A validation of the post concussion symptom scale in the assessment of complex concussion using cognitive testing and functional MRI. J Neurol Neurosurg Psychiatry, 78(11), 1231–1238. Smith, S. M. & Nichols, T. E. (2009). Threshold-free cluster enhancement: addressing problems of smoothing, threshold dependence and localisation in cluster inference. Neuroimage, 44(1), 83–98. Ruff, R. M., Camenzuli, L. & Mueller, J. (1996). Miserable minority: emotional risk factors that influence the outcome of a mild traumatic brain injury. Brain Inj, 10(8), 551–565. Rutherford, W. H., Merrett, J. D. &McDonald, J. R. (1979). Symptoms at one year following concussion from minor head injuries. Injury, 10(3), 225–230. Hudak, A., Warner, M., Marquez de la Plata, C., Moore, C., Harper, C. & Diaz-Arrastia, R. (2011). Brain morphometry changes and depressive symptoms after traumatic brain injury. Psychiatry Res, 191(3), 160–165. Levine, B., Kovacevic, N., Nica, E. I., et al. (2008). The Toronto traumatic brain injury study: injury severity and quantified MRI. Neurology, 70(10), 771–778. Bush, G., Whalen, P. J., Rosen, B. R., Jenike, M. A., McInerney, S. C. & Rauch, S. L. (1998). The counting Stroop: an interference task specialized for functional neuroimaging—validation study with functional MRI. Hum Brain Mapp, 6(4), 270–282. Egner, T. & Hirsch, J. (2005). The neural correlates and functional integration of cognitive control in a Stroop task. Neuroimage, 24(2), 539–547. Kolassa, I. T., Wienbruch, C., Neuner, F., et al. (2007). Altered oscillatory brain dynamics after repeated traumatic stress. BMC Psychiatry, 7, 56. Lanius, R. A., Bluhm, R., Lanius, U. & Pain, C. (2009). A review of neuroimaging studies in PTSD: heterogeneity of response to symptom provocation. J Psychiatr Res, 2006, 40(8), 709– 729. 52. Haupt S, Axmacher N, Cohen MX, Elger CE, Fell J. Activation of the caudal anterior cingulate cortex due to task-related interference in an auditory Stroop paradigm. Hum Brain Mapp, 30(9), 3043–3056. Polli, F. E., Barton, J. J. S., Cain, M. S., Thakkar, K. N., Rauch, S. L. & Manoach, D. S. (2005). Rostral and dorsal anterior cingulate cortex make dis-sociable contributions during antisaccade error commission. Proc Natl Acad Sci U S A, 102(43), 15700–15705. Kiehl, K. A., Liddle, P. F. & Hopfinger, J. B. (2000). Error processing and the rostral anterior cingulate: an event-related fMRI study. Psychophysiology, 37(2), 216–223. Chen, J. K., Johnston, K. M., Petrides, M. & Ptito, A. (2008). Neural substrates of symptoms of depression following concussion in male athletes with persisting postconcussion symptoms. Arch Gen Psychiatry, 65(1), 81–89. di Pellegrino, G., Ciaramelli, E. & Làdavas, E. (2007). The regulation of cognitive control following rostral anterior cingulate cortex lesion in humans. J Cogn Neurosci, 19(2), 275–286. Bohnen, N. & Jolles, J. (1992). Neurobehavioral aspects of postconcussive symptoms after mild head injury. J Nerv Ment Dis, 180(11), 683– 692. Cicerone, K. D. & Azulay, J. (2002). Diagnostic utility of attention measures in postconcussion syndrome. Clin Neuropsychol, 16(3), 280–289. Vogt, B. A. & Laureys, S. (2005). Posterior cingulate, precuneal and retrosplenial cortices: cytology and components of the neural network correlates of consciousness. Prog Brain Res, 150, 205–217. Silver, J. M., McAllister, T. W. & Yudofsky, S. C. (2011). Textbook of traumatic brain injury. 2nd ed. Arlington, Va: American Psychiatric Publishing. Bendlin, B. B., Ries, M. L., Lazar, M., et al. (2008). Longitudinal changes in patients with traumatic brain injury assessed with diffusion-tensor and volumetric imaging. Neuroimage, 42(2), 503–514. Gultekin, S. H. & Smith, T. W. (1994). Diffuse axonal injury in craniocerebral trauma: a comparative histologic and immunohistochemical study. Arch Pathol Lab Med, 118(2), 168–171. Haznedar, M. M., Buchsbaum, M. S., Hazlett, E. A., Shihabuddin, L., New, A. & Siever, L. J. (2004). Cingulate gyrus volume and metabolism in the schizophrenia spectrum. Schizophr Res, 71(2-3), 249–262. Max, J. E., Keatley, E., Wilde, E. A., et al. (2012). Depression in children and adolescents in the first 6 months after traumatic brain injury. Int J Dev Neurosci, 30(3), 239–245. Amburn, B. (2004). Brain Injuries Lead Ira War Injuries. Washington Times. Arciniegas, D., Olincy, A., Topkoff, J., McRae, K., Cawthra, E., Filley, C. M., Reite, M. & Adler, L. E. (2000). Impaired auditory gating and P50 nonsuppression following traumatic brain injury. J Neuropsychiatry Clin Neurosci, 12, 77-85. Batista-Nascimento, L., Pimentel, C., Menezes, R. A. & Rodrigues-Pousada, C. (2012). Iron and neurodegeneration: from cellular homeostasis to disease. Oxid Med Cell Longev, 2012, 128647. Baugh, C. M., Stamm, J. M., Riley, D. O., Gavett, B. E., Shenton, M. E., Lin, A., Nowinski, C. J., Cantu, R. C., McKee, A. C. & Stern, R. A. (2012). Chronic traumatic encephalopathy: neurodegeneration following repetitive concussive and subconcussive brain trauma. Brain Imaging Behav, 6, 244-254. Berg, D., Gerlach, M., Youdim, M. B., Double, K. L., Zecca, L., Riederer, P. & Becker, G. (2001). Brain iron pathways and their relevance to Parkinson’s disease. J Neurochem, 79, 225-236. Bouras, C., Giannakopoulos, P., Good, P. F., Hsu, A., Hof, P. R. & Perl, D. P. (1997). A laser microprobe mass analysis of brain aluminum and iron in dementia pugilistica: comparison with Alzheimer’s disease. Eur Neurol, 38, 53-58. Bradbury, M. W. (1997). Transport of iron in the blood-brain-cerebrospinal fluid system. J Neurochem, 69, 443-454. Brar, S., Henderson, D., Schenck, J. & Zimmerman, E. A. (2009). Iron accumulation in the substantia nigra of patients with Alzheimer disease and parkinsonism. Arch Neurol, 66, 371-374. Campbell, A., Smith, M. A., Sayre, L. M., Bondy, S. C. & Perry, G. (2001). Mechanisms by which metals promote events connected to neurodegenerative diseases. Brain Research Bulletin, 55, 125-132. Dallman, P. R., Siimes, M. A. & Manies, E. C. (1975). Brain iron: persistent deficiency following short-term iron deprivation in the young rat. Br J Haematol, 31, 209-215. Faul, M. L. W., Wald, M. M. & Coronado, V. G. (2010). Traumatic Brain Injury in the United States: Emergency Department Visits, Hospitalizations and Deaths, 2002-2006. Ge, Y., Jensen, J. H., Lu, H., Helpern, J. A., Miles, L., Inglese, M., Babb, J. S., Herbert, J. & Grossman, R. I. (2007). Quantitative assessment of iron accumulation in the deep gray matter of multiple sclerosis by magnetic field correlation imaging. AJNR Am J Neuroradiol, 28, 1639-1644. Gerlach, M., Ben-Shachar, D., Riederer, P. & Youdim, M. B. (1994). Altered brain metabolism of iron as a cause of neurodegenerative diseases? J Neurochem, 63, 793-807. Gu, Y., Hua, Y., He, Y., Wang, L., Hu, H., Keep, R. F. & Xi, G. (2011). Iron accumulation and DNA damage in a pig model of intracerebral hemorrhage. Acta Neurochir Suppl, 111, 123-128. Guilmette, T. J. & Rasile, D. (1995). Sensitivity, Specificity, and Diagnostic-Accuracy of 3 Verbal Memory Measures in the Assessment of Mild Brain Injury. Neuropsychology, 9, 338-344. Haacke, E. M., Mittal, S., Wu, Z., Neelavalli, J. & Cheng, Y. C. (2009). Susceptibility-weighted imaging: technical aspects and clinical applications, part 1. AJNR Am J Neuroradiol, 30, 19-30. Hall, E. D., Vaishnav, R. A. & Mustafa, A. G. (2010). Antioxidant therapies for traumatic brain injury. Neurotherapeutics, 7, 51-61. Ho, L., Zhao, W., Dams-O’Connor, K., Tang, C. Y., Gordon, W., Peskind, E. R., Yemul, S., Haroutunian, V. & Pasinetti, G. M. (2012). Elevated plasma MCP-1 concentration following traumatic brain injury as a potential “predisposition” factor associated with an increased risk for subsequent development of Alzheimer’s disease. J Alzheimers Dis, 31, 301-313. Jensen, J. H., Chandra, R., Ramani, A., Lu, H., Johnson, G., Lee, S. P., Kaczynski, K. & Helpern, J. A. (2006). Magnetic field correlation imaging. Magn Reson Med, 55, 1350-1361. Jensen, J. H., Szulc, K., Hu, C., Ramani, A., Lu, H., Xuan, L., Falangola, M. F., Chandra, R., Knopp, E. A., Schenck, J., Zimmerman, E. A. & Helpern, J. A. (2009). Magnetic field correlation as a measure of iron-generated magnetic field inhomogeneities in the brain. Magn Reson Med, 61, 481-485. Jensen, J. H., Tang, H., Tosti, C. L., Swaminathan, S. V., Nunez, A., Hultman, K., Szulc, K. U., Wu, E. X., Kim, D., Sheth, S., Brown, T. R. & Brittenham, G. M. (2010). Separate MRI quantification of dispersed (ferritin-like) and aggregated (hemosiderin-like) storage iron. Magn Reson Med, 63, 1201-1209. Jeong, S. Y., Rathore, K. I., Schulz, K., Ponka, P., Arosio, P. & David, S. (2009). Dysregulation of iron homeostasis in the CNS contributes to disease progression in a mouse model of amyotrophic lateral sclerosis. J Neurosci, 29, 610-619. Kay, T. H. D., Adams, R., et al (1993). Definition of mild traumatic brain injury. J Head Trauma Rehabil, 8, 86-87. Long, D. A., Ghosh, K., Moore, A. N., Dixon, C. E. & Dash, P. K. (1996). Deferoxamine improves spatial memory performance following experimental brain injury in rats. Brain Res, 717, 109-117. Magnoni, S., Esparza, T. J., Conte, V., Carbonara, M., Carrabba, G., Holtzman, D. M., Zipfel, G. J., Stocchetti, N. & Brody, D. L. (2012). Tau elevations in the brain extracellular space correlate with reduced amyloid-beta levels and predict adverse clinical outcomes after severe traumatic brain injury. Brain, 135, 1268-1280. Mannix, R. C. & Whalen, M. J. (2012). Traumatic brain injury, microglia, and Beta amyloid. Int J Alzheimers Dis, 2012, 608732. McAllister, T. W., Ford, J. C., Flashman, L. A., Maerlender, A., Greenwald, R. M., Beckwith, J. G., Bolander, R. P., Tosteson, T. D., Turco, J. H., Raman, R. & Jain, S. (2014). Effect of head impacts on diffusivity measures in a cohort of collegiate contact sport athletes. Neurology, 82, 63-69. McKee, A. C., Cantu, R. C., Nowinski, C. J., Hedley-Whyte, E. T., Gavett, B. E., Budson, A. E., Santini, V. E., Lee, H. S., Kubilus, C. A. & Stern, R. A. (2009). Chronic traumatic encephalopathy in athletes: progressive tauopathy after repetitive head injury. J Neuropathol Exp Neurol, 68, 709-735. McKee, A. C., Stern, R. A., Nowinski, C. J., Stein, T. D., Alvarez, V. E., Daneshvar, D. H., Lee, H. S., Wojtowicz, S. M., Hall, G., Baugh, C. M., Riley, D. O., Kubilus, C. A., Cormier, K. A., Jacobs, M. A., Martin, B. R., Abraham, C. R., Ikezu, T., Reichard, R. R., Wolozin, B. L., Budson, A. E., Goldstein, L. E., Kowall, N. W. & Cantu, R. C. (2013). The spectrum of disease in chronic traumatic encephalopathy. Brain, 136, 43-64. Nisenbaum, E. J., Novikov, D. S. & Lui, Y. W. (2014). The presence and role of iron in mild traumatic brain injury: an imaging perspective. J Neurotrauma, 31, 301-307. Onyszchuk, G., LeVine, S. M., Brooks, W. M. & Berman, N. E. (2009). Post-acute pathological changes in the thalamus and internal capsule in aged mice following controlled cortical impact injury: a magnetic resonance imaging, iron histochemical, and glial immunohistochemical study. Neurosci Lett, 452, 204-208. Prigatano, G. P. & Gale, S. D. The current status of postconcussion syndrome. Curr Opin Psychiatry, 24, 243-250. Raz, E., Jensen, J. H., Ge, Y., Babb, J. S., Miles, L., Reaume, J., Grossman, R. I. & Inglese, M. (2011). Brain Iron Quantification in Mild Traumatic Brain Injury: A Magnetic Field Correlation Study. AJNR Am J Neuroradiol. Rigg, J. L. & Mooney, S. R. Concussions and the military: issues specific to service members. PMR, 3, S380-386. Rimel, R. W., Giordani, B., Barth, J. T., Boll, T. J. & Jane, J. A. (1981). Disability caused by minor head injury. Neurosurgery, 9, 221-228. Schenck, J. F. & Zimmerman, E. A. (2004). High-field magnetic resonance imaging of brain iron: birth of a biomarker? NMR Biomed, 17, 433-445. Schweser, F., Sommer, K., Deistung, A. & Reichenbach, J. R. (2012). Quantitative susceptibility mapping for investigating subtle susceptibility variations in the human brain. Neuroimage, 62, 2083-2100. Sivanandam, T. M. & Thakur, M. K. (2012). Traumatic brain injury: a risk factor for Alzheimer’s disease. Neurosci Biobehav Rev, 36, 1376-1381. Stern, R. A., Riley, D. O., Daneshvar, D. H., Nowinski, C. J., Cantu, R. C. & McKee, A. C. Long-term consequences of repetitive brain trauma: chronic traumatic encephalopathy. PMR, 3, S460-467. Symons, M. C. R. & Gutteridge, J. M. C. (1998). Free radicals and iron: chemistry, biology, and medicine. Oxford; New York: Oxford University Press. Tran, H. T., Sanchez, L., Esparza, T. J. & Brody, D. L. (2011). Distinct temporal and anatomical distributions of amyloid-beta and tau abnormalities following controlled cortical impact in transgenic mice. PLoS One, 6, e25475. Veterans Administration Department of Defense Clinical Practice (2009). Guideline for Mangement of Concussion/Mild Traumatic Brain Injury. vol. 2011: Department of Veteran Affairs/Department of Defense. Yehuda, S. & Mostofsky, D. I. (2010). Iron deficiency and overload : from basic biology to clinical medicine. New York, N.Y.: Humana Press. Youdim, M. B. G. M. & Riederer, P. (2010). Iron deficiency and excess in the Brain: Implications for Cognitive Impairment and Neurodegeneration. New York, N.Y.: Humana Press. Arciniegas, D. B. & Silver, J. M. (2001). Regarding the search for a unified definition of mild traumatic brain injury. Brain Inj, 15, 649-652. Association, A. P. (2010). Diagnostic and Statistical Manual of Mental Disorders. 4th ed, Text Revision. Washington, DC: American Psychiatric Association. Barca, L., Cappelli, F. R., Amicuzi, I., Apicella, M. G., Castelli, E. & Stortini, M. (2009). Modality-specific naming impairment after traumatic brain injury (TBI). Brain Inj, 23, 920-929. Battiti, R. (1994). Using Mutual Information for Selecting Features in Supervised Neural-Net Learning. Ieee T Neural Networ, 5, 537-550. Bianchi, A., Bhanu, B., Donovan, V. & Obenaus, A. (2014). Visual and Contextual Modeling for the Detection of Repeated Mild Traumatic Brain Injury. IEEE Trans Med Imaging, 33, 11-22. Cohen, B. A., Inglese, M., Rusinek, H., Babb, J. S., Grossman, R. I. & Gonen, O. (2007). Proton MR spectroscopy and MRI-volumetry in mild traumatic brain injury. AJNR Am J Neuroradiol, 28, 907-913. Defense VADo. (2009). Clinical Practice Guideline for Mangement of Concussion/Mild Traumatic Brain Injury. vol. 2011: Department of Veteran Affairs/Department of Defense. Elliott, M. A., Walter, G. A., Swift, A., Vandenborne, K., Schotland, J. C. & Leigh, J. S. (1999). Spectral quantitation by principal component analysis using complex singular value decomposition. Magnetic resonance in medicine: official journal of the Society of Magnetic Resonance in Medicine/Society of Magnetic Resonance in Medicine, 41, 450-455. Faul, M. L. W., Wald, M. M. & Coronado, V. G. (2010). Traumatic Brain Injury in the United States: Emergency Department Visits, Hospitalizations and Deaths. 2002-2006. Fischl, B., Salat, D. H., Busa, E., Albert, M., Dieterich, M., Haselgrove, C., van der Kouwe, A., Killiany, R., Kennedy, D., Klaveness, S., Montillo, A., Makris, N., Rosen, B. & Dale, A. M. (2002). Whole brain segmentation: automated labeling of neuroanatomical structures in the human brain. Neuron, 33, 341-355. Fischl, B., van der Kouwe, A., Destrieux, C., Halgren, E., Segonne, F., Salat, D. H., Busa, E., Seidman, L. J., Goldstein, J., Kennedy, D., Caviness, V., Makris, N., Rosen, B. & Dale, A. M. (2004). Automatically parcellating the human cerebral cortex. Cereb Cortex, 14, 11-22. Gagliardi, F. (2011). Instance-based classifiers applied to medical databases: diagnosis and knowledge extraction. Artif Intell Med, 52, 123-139. Grossman, E. J. & Inglese, M. (2016). The Role of Thalamic Damage in Mild Traumatic Brain Injury. J Neurotrauma, 33, 163-167. Kay, T. H. D., Adams, R., et al. (1993). Definition of mild traumatic brain injury. J Head Trauma Rehabil, 8, 86-87. Kierans, A. S., Kirov, II., Gonen, O., Haemer, G., Nisenbaum, E., Babb, J. S., Grossman, R. I. & Lui, Y. W. (2014). Myoinositol and glutamate complex neurometabolite abnormality after mild traumatic brain injury. Neurology, 82, 521-528. McAllister, T. W., Saykin, A. J., Flashman, L. A., Sparling, M. B., Johnson, S. C., Guerin, S. J., Mamourian, A. C., Weaver, J. B. & Yanofsky, N. (1999). Brain activation during working memory 1 month after mild traumatic brain injury: a functional MRI study. Neurology, 53, 1300-1308. Peng, H., Long, F. & Ding, C. (2005). Feature selection based on mutual information: criteria of max-dependency, max-relevance, and min-redundancy. IEEE transactions on pattern analysis and machine intelligence, 27, 1226-1238. Prevention, C. D. C. (2003). National Center for Injury Prevention and Control: Report to Congress on Muld Traumatic Brain Injury in the United States: Steps to Prevent a Serious Public Health Problem. Center for Disease Control and Prevention Atlanta, GA.
Ruff, R. M. & Jurica, P. (1999). In search of a unified definition for mild traumatic brain injury. Brain Inj, 13, 943-952. Teasdale, G. & Jennett, B. (1974). Assessment of coma and impaired consciousness. A practical scale. Lancet, 2, 81-84. (WHO) WHO, (2007). International Classification of Diseases and Related Health Problems. 10th revision. Geneva (United Nations): World Health Organization. Zhou Y, Wang Y, Kenul D, Xue Y, Ge Y, Reaume, Grossman RI, Lui YW (2013b), Detection of mild traumatic brain injury utilizing multifeature analysis of MR, ISMRM, 2688. Zhou, Y., Lui, Y. W., Zuo, X. N., Milham, M. P., Reaume, J., Grossman, R. I. & Ge, Y. (2014a). Characterization of thalamo-cortical association using amplitude and connectivity of functional MRI in mild traumatic brain injury. J Magn Reson Imaging, 39, 1558-1568. Zhou, Y., Yu, F. & Duong, T. (2014b). Multiparametric MRI characterization and prediction in autism spectrum disorder using graph theory and machine learning. PLoS One, 9, e90405.